This is a great LP from back when the elder statesman of hard-bop, Art Blakey was... well, not young (Art Blakey was never young), but when his ideas about the potential of small group jazz were first reaching fruition. 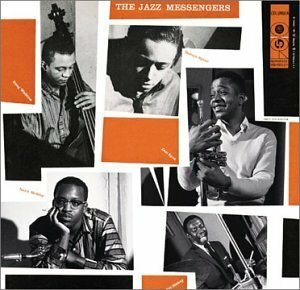 The early versions of The Jazz Messengers featuring Horace Silver at the piano are often considered to be the best - though how can you compare, say, the 1960 Lee Morgan-Wayne Shorter band unfavourably with this one? For this classic Columbia session (the last with Silver), Donald Byrd came in on trumpet to replace Kenny Dorham; Hank Mobley has a prominent role both as soloist and composer, being responsible for 3 tunes including the album-in-microcosm that is 'Infra-Rae' and Blakey drum vehicle 'Hank's Symphony'. That last track is a must for lovers of Blakey's energetic style - after a strong opening theme, a switch to double time is heralded by Blakey's trademark rolls. The whole track is a masterclass in hard bop drumming, in fact. There then follows what is, quite simply, the finest drum solo in recorded jazz (at least that i've heard so far). Blakey is a virtuoso, and is in incredible form here, managing to invent while playing fast and hard - very hard (I wouldn't like to be one of his drum skins... ouch!). Basically this is a great example of early hard bop played by one of it's undisputed masters. A storming set that deserves to be in all of your collections.